Merel van Engelen (1989) is a visual artist living in the Netherlands. Within her work she is looking for an innovative and contemporary time frame within the context of the fine arts. Through artistic research she treats concepts like “landscape”, “time”, “space”, “peace”, and “self-consciousness”. While making a work of art she tries to capture “experiences and perceptions” in her canvases in such a way that the spectator is given the possibility to reflect, and go beyond the issues of the day. In her paintings the space in which we move and live is the central topic. With her paintings she wants to create a place which enables the viewer to reflect and contemplate. 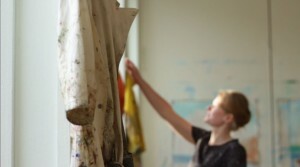 Therefore her art can be seen as a pause to gain new insights. With her work she does not only want people to restructure their awareness of their enviroment, but she also want to touch the lives of people and make it more beautiful. By finding beauty in the experience of the environment around her and by putting these experiences down on canvases, she hopes that her viewers gain new perspectives on the world around them, but also gain new perspectives on the paintings themselves. Merel graduated in 2012 from the Royal Academy of Fine Arts in Antwerp (BA, direction painting) and in 2015 at the Erasmus University Rotterdam (MA, Cultural studies).